The dark side of the moon hides a jungle rustling with animals as free as they are wild. They live with their nose in the wind and their head in the stars, in the lightness and sweet pleasure of weightlessness. In the heat of the savannah, they welcome lazybones, men in the moon and dream chasers like old friends. A fanfare of roars, sighs, whinnies and cries ring out to greet each new arrival: no one even thinks of sleeping when it’s time to set off on a Moon Safari. The notes include mandarin, verbena, neroli, vetiver, leather and tonka bean. Update: Moon Safari was developed by perfumer Aliénor Massenet. Another update: Moon Safari is now known as Moon Fever. Have we started Le Prix Eau Faux already? I take copy with a grain of salt most of the time, but this one really is hysterical. It’s rather amazing! But I’d like to smell this, despite the fact that I need another vetiver like a hole in the head. This one is amazing, received my bottle today, it starts fresh but dries down beautifully slightly sweet, little leathery smokey. GORGEOUS. Definitely great for this time of year. On me no citrus remains during the drydown. I am a happy chick sniffing my wrist. In a weird sort of way I like it. I reads like stream of consciousness poetry. Of course, clearly not what they were going for. Hey now… I’d like to live with my nose in the savannah wind and my head in the stars, too. I have to say that night in the African veldt is magical and …. noisy! They got that part right – it can be hard to sleep through the noise made by hyenas and lions and birds. I’d like to give this a sniff; notes sound good. Seems like a lot of citrus for “the leather side of vetiver” and a “dark side of the moon” fragrance… so the note list disappointed me. If I ignore what I was expecting, though, I have a feeling I’d like it. And of course, my standard…cute bottle! But there might be very little citrus in the mix, you know? Hard to say without smelling it. Leather smells like beef jerky on me. This otherwise sounded intriguing to me, too. Beef jerky! Ugh, but that is hilarious! Sadly, Cuir de Russie smells like barnyard on me. I mean, raw hides and fur and manure and dirt, the whole real-life bit. I do okay with Jolie Madame, though. Went to their site and all their bottles are fantastic, including this one, though I’m not sure the scent would thrill me. 68€ for 30ml is a budget-buster, though. I’ve noticed Siwa on split sites recently..
Joe, I’ve never tried a single one, so can’t comment…but yeah, they aren’t bargains! Gourgeous Gourmand if you like those…….i am on one of those split sites :), these are definitely worth the price. I love the longevity of thee fragrances on my skin. Thanks, parfumnut. I think the one I’d really be interested in is Inle. Its funny you say that, as i sold my bottle because i liked it the least, to me that one was a very generic scent, nothing special. I am looking forward to getting Moon Safari, should have it by end of week. Sounds so interesting… adding this to my seriously unending list of samples to check out. AHHHHHHHHHHHHHH….i am excited for this one, should have mine by end of week. This one sounds wonderful. I already have Siwa from the Memo line and love it. this line is wonderful. Good, let us know how it is!! Judging from the notes, could it be unisex? mandarin, verbena, neroli … ? 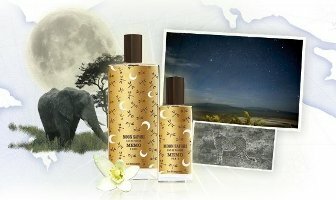 So the dark side of the moon smells like a citrus garden? Outrageous ad copy but I enjoyed reading it! Boo, this reminds me that I can’t find my samples of Kenzo L’elephant or Le Tigre ANYWHERE. Le Tigre would be perfect for a rainy NorCal mountains day like today. I *hate* missing samples. And I have a lot of them. Ooooo. LOVE vetiver; deep, dark greenery, with a champagne sweetness and frayed-tweed, reed-like dryness. Love it ! There is no such thing as “too many” vetivers, Robin ;). So far, I seem to agree w/ that sentiment: I certainly own a lot of them!